the ones where I spent every waking moment trying to figure out how I could pinch every possible penny to the point that I couldn’t enjoy what I was doing. I remember entire vacations where I was so obsessed with money that I never relaxed enough to even pay attention to where I was. This time, I had the money set aside. I figured out my budget in advance and chose a hotel that both fit into my budget and fulfilled my desires (i.e. – near the water, hot tub, kitchenette). I brought food with me to cut down on costs, but I also had money set aside for meals. I didn’t have any money set aside for activities because I knew that I’d be focused on writing most of the time and walking by the water the rest of it. What an absolutely phenomenal relief! I was able to go without the specter that has haunted every previous getaway. While I was careful to stay within my budget, I did allow myself one little splurge (and by little I mean under $20!). It’s potentially the coolest necklace I’ve ever seen! 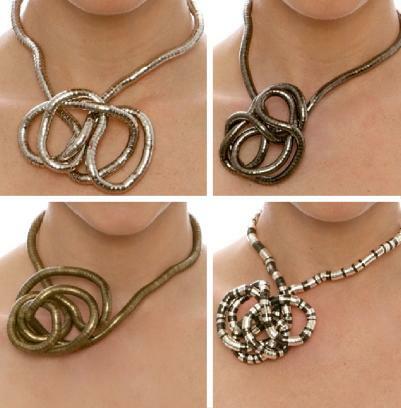 It’s called “Le Twist.” It’s a 35-inch loop of malleable metal that can be twisted into any shape you want! It can be worn as a bracelet, a necklace, a hairband…whatever! Now I just have to find somewhere to wear it! Hi! Just read your little story on vacationing in Maine – fun necklace! I’ve always believed that one should live in their vacation home. I moved to mine (Camden, Maine) when I was 22. I’m now 44 and working as a nonprofit retreat and meditation center director. Next time you’re “downeast” drop by for a little peace and de-stress!